For today, I have an avant/ambient treat directly from Constellation Records. In anticipation of three new debut releases from Jason Sharpe, Off World, and Automatisme, the good people at Constellation saw fit to compile and share two tracks from each release. I gave the tracks a listen earlier today and very much enjoyed the lengthy, dystopian chill of Automatisme's "Simultanéité 1," and the infestation of plucked strings that carry Jason Sharpe's "A Boat Upon Its Blood (Part 1)." I was also taken by the very loose "Wonder Farm" from Off World, its frontier-ist twang strange against the seesaw tumble of artificial swats of percussion. Release information and links were provided by Rarely Unable. If you like what you hear, please head over to Constellation and spend a couple bucks. 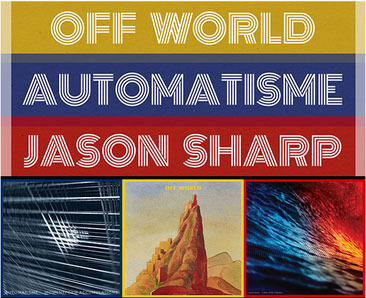 Constellation’s three new Autumn releases by Off World, Automatisme and Jason Sharp shall land on September 30th and are now available for LP and CD pre-order. Introducing the debut collection of roving, semi-improvised, collaborative song deconstructions by Off World, featuring long-standing Constellation artist Sandro Perri and a coterie of fellow-traveling producers. Off World is the moniker under which a stockpile of primarily electronic, studio-based instrumental works will be issued over the next couple of years – this first volume rounds up music that emerged from a 2-day session in London orchestrated by producer Drew Brown (Lower Dens, Blonde Redhead, Beck), between himself, Perri, Susumu Mukai (Zongamin) and M J Silver (Mickey Moonlight) after learning that Perri was a huge fan of both Mukai and Silver’s work. Off World 1 resists easy categorisation: not ambient “easy listening”, not strictly “improvised”, not “retro” – but eccentrically absorbing and soothingly mischievous electronic instrumentals, where vintage synthesizers and drum machines bubble and lurch, testing boundaries of melody and structure, with occasional accents from traditional/acoustic instrumentation. The result is genuinely exploratory, peculiar, warm and sui generis electronic music that sounds like it could have issued from any time in the past 40-50 years. Momentform Accumulations is the debut album by rhythmic electronic/glitch/drone artist Automatisme. Taking cues from minimalist electronic pioneers of the late 90’s and early 2000’s – Pan Sonic/Maika Vainio, Alva Noto/Carsten Nicolia and Raster-Noton, Pole/~scape recordings to name a few – Ste-Hyacinthe, QC-based producer and visual artist William Jourdain has been self-releasing an impressive body of work over the last several years. The label are thrilled to be working with this promising producer and look forward to Automatisme tracing new affinities within the Constellation catalog. Taking site-specific field recordings as his starting point, and with nominal reliance on synthesizers, Jourdain samples, signal bends, and transforms his source material into deliberate and elemental soundscapes of white and pink noise, spatial drone and methodically additive beats. Momentform Accumulations compiles much of Automatisme’s most recent and most rhythmically-driven work. A Boat Upon Its Blood is from Montréal-based improviser, composer and reedist Jason Sharp; a fixture of Montreal’s avant-garde and improv music communities, and an alumnus of Sam Shalabi’s Land of Kush orchestra and Matana Roberts’ Coin Coin Chapter One ensemble. With this debut recording issued under his own name, Sharp presents a highly compelling suite of contemporary electro-acoustic music that reveals the shape and scope of his vision as a composer and bandleader in his own right. Inspired by Robert Creely’s poem “The Heart”, and using custom-built equipment to translate breath and heart rate into variegated sonic triggers, along with other modes of signal processing and in tandem with traditional instrumentation, A Boat Upon Its Blood features Sharp’s own reed playing and contributions from a few guest musicians, particularly Josh Zubot on violin and Joe Grass on pedal steel guitar. The work is a tour-de-force of genre-defying, immersive, accessible and deeply satisfying modern composition.